To help in the teaching and learning process, Feeding His Lambs Ministries has republished this delightful collection of scripture songs. Every song is beautifully recorded on the CD in the same keys and range as printed in the Sing a Bible Verse music books. Bob Edwards and Wayne Hooper, who sang together in the King's Heralds Quartet for fourteen years, combine their talents to sing some of the songs as solos, some in unison, and others in an answering style. Calvin Taylor provides creative keyboard accompaniments. Please Note: The vast majority of the scripture songs on this cd are from the King James Version of the Bible. Four songs: Acts 10:34, Matthew 6:14, Matthew 25:40 and Psalm 34:10 are from the N.E.B. version of the Bible. One song: Matthew 19:14 is from the R.S.V. version. 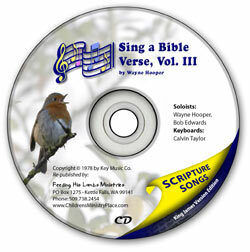 Sing a Bible Verse song book by Wayne Hooper for Kindergarten & Primary. These 52 original songs furnish an easy way for the children to learn a Bible memory verse every week of the year.